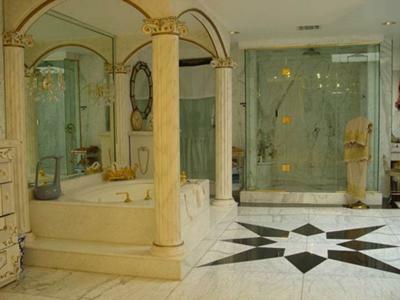 This luxury bathroom is unashamedly theatrical, what with the canopied bath and the bold decor. There is a sense of space which is enhanced by the restful light colors and the scale of the shower and the bath. * The beauty of marble on a large scale. By that I don't mean lots of marble (there's that too) but the fact that they didn't use standards sized tiles, but used outsized slabs of marble with minimum grout lines for the floor. From a design point of view, I find the geometric inset motif on the floor incongruous. Both the color and the shape do not fit at all IMHO. It is too stark and geometric. I would much rather see a plush Oriental carpet (in the same muted tones as the rest of the bathroom) in that space. Persian carpets in dream bathrooms are pure magic! I especially like the expansive mirror in the bath alcove. It creates depth by repeating the canopy in the reflections and I can imagine it will look beautiful when steamed up too. A very nice and unusual shade of green - almost jade and jewel-like. Congrats to the bathroom you have created. It's so beautiful the marble make it always in style forever. Thanks for your beautiful design. I love the use of light and colour and the illusion it gives with refractory light. It gives me great ideas for our bathroom renovation. Wow! The bathtub looked very Romanesque and enchanting. I would definitely take a bath in that tub. I like this bathroom my idea of one like this. It's outstanding beautiful!!! Join in and write your own page! It's easy to do. How? Simply click here to return to The Luxury Bathrooms Gallery.